We've revamped our entire range of apps across iOS and Android, tablet and mobile. Download now to keep trading on the move. 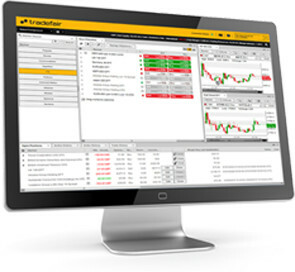 Tradefair is home to one of the biggest UK-based online financial spread betting platforms. It allows customers to place spread bets on thousands of financial instruments safe in the knowledge that we offer some of the tightest spreads on one of the most reliable spread betting platforms. Spread betting has many advantages over other forms of financial trading, partly due to the laws governing financial spread betting in the UK - it's tax free* meaning there are no broker fees and our customers pay no commission on their financial spread bets. At Tradefair we do not hide the risks involved in financial spread betting, whilst a spread trader can make big profits very quickly it is equally possible for losses to swiftly occur. This is why we offer our clients a high degree of support and invaluable features such as automatic stop losses, 24 hour markets, spread betting guides, tutorials, chart pattern recognition software, an expert financial calendar and the ability to trade on margin. Furthermore, if you're not yet comfortable opening a real money account, we can offer you a no risk financial spread betting demo account. Open a financial spread betting account with us today and you will free get access to all our features. Whether you're a new spread trader or have years of experience, our site and platform has many great tools available for you to utilise. *Tax Laws may change and may differ outside of the UK.